The number of online reservations keeps growing. Your guests are happy being able to book online quickly. On the other hand they don’t want to feel like a number. As a hotelier or restaurateur you can adapt to this by using E-mailinglist. Give your guests the VIP feeling they deserve with a personal connection. With automatic e-mails this software will enhance the customer journey of your guests. The result: higher conversions and a better customer satisfaction. 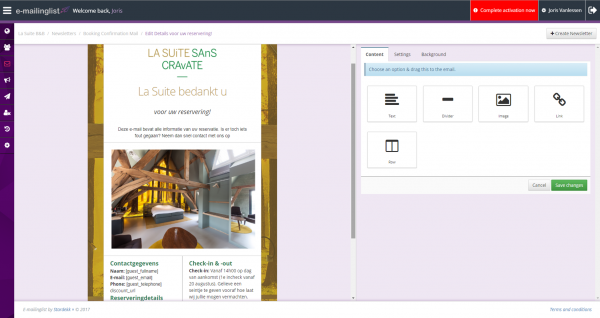 E-mailinglist is a tool to help you strengthen the connection with your guests and enhance their guest experience. Almost effortlessly, everything runs automatically. Because E-mailinglist connects with other Stardekk products, you don't need to enter the contact information again. This will save you time you can use to spend with your guests and your business and not wasted on administration. Great, right?